When introducing a new cat into a household, particularly when it is a full grown adult, other pets may feel jealous and resentful. They may take themselves away or hide and this can be distressing for owners. While it is very tempting to lavish love and attention onto a newly adopted cat it is equally important for the existing animals to know that they are still much loved. Giving all the animals lots of attention will let them know that they are all special. 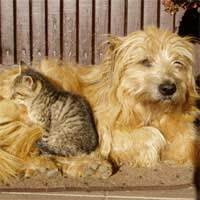 When people adopt a cat and bring him into a household that contains other animals, the intention is, of course, that all the animals will bond together into a happy pack. This is achievable only if the animals are allowed to find their own position within their 'pecking order'. It is important not to try and force the animals to get along. There is likely to be a little uncertainty and even some light fighting, however this is nature's way of the animals establishing their order and getting to know each other. Eventually things will settle down. Problems often arise with animals that haven't been neutered as these are inclined to want to dominate others. Unless a family is very lucky, there are likely to be some upheavals as a newly adopted cat is settling into his new home. As long as any hissing and gentle fighting doesn't get out of hand, it is best to let the animals work their way through any disagreements. If the fighting continues or if one is getting bullied then it is time to intervene. The animals will need to be supervised and watched closely. Ways to help avoid long term disagreements is to ensure that each one has his own feeding bowl, as this will stop fighting over food, and ensuring that the aggressor is fed last. This demonstrates that he is at the bottom of your pecking order what ever he might think! The welfare organisation will advise whether a cat should be rehomed with other animals. It is very important to listen to their advice as this could have long term implications. Even if a cat is homed on his own to start with, if it is the intention in the future to own more pets then there could be future problems. Before adopting a cat, if a family has other animals or is planning to, it is important to talk this through with the welfare organisation and act on their advice. Watching a adopted cat become part of a new family is a very rewarding experience. A few simple steps should help to ensure that the new cat becomes part of the family and leads a long and happy life.